People could be skiing in Bahrain within just three-and-a-half years. 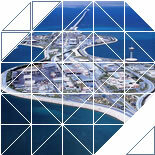 Plans for the Bahraini Iceberg project are being finalised. The first phase, which will include a themed five-star hotel, snow slope and shopping mall will take three years to complete. It will be opened to the public while work continues on the second phase, including a marina, beach and ice hockey rink, which will take a further two years. The snow slope will be the longest of its kind in the world and will provide a year-round venue for snow sports. It would be a wonderful family sports and leisure destination in Bahrain.